Carefully positioned upwind from the impala herd, making sure to remain camouflaged in the bushes, the cheetahs’ intention to hunt was clear. What we didn’t know, is that it would take about three hours before their dinner was served. 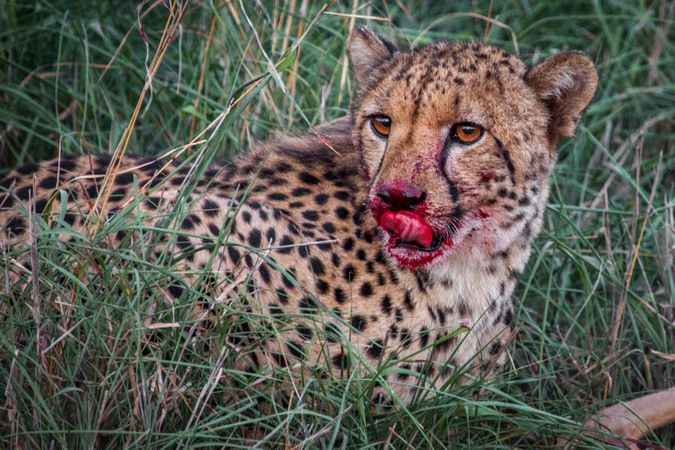 In the wild, there’s no such thing as fast food. 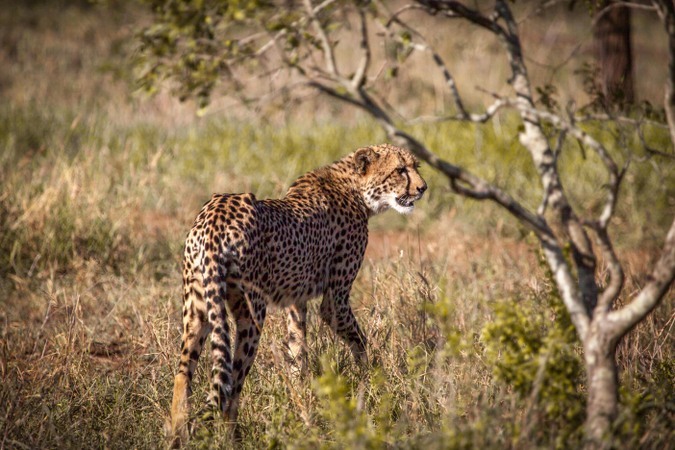 Predators, such as cheetahs, can spend hours stalking their prey before making a move. It’s a tedious process of patience. 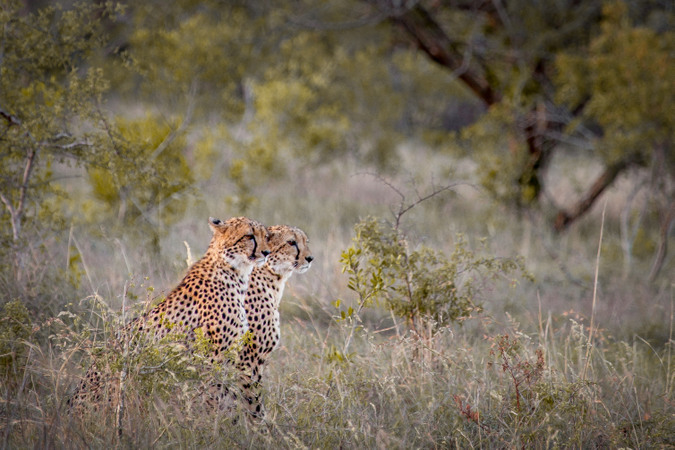 While out on a game drive with Rhino River Lodge in the Manyoni Private Game Reserve, I was treated to a wonderful sighting of an adult female cheetah and her two sub-adult cubs. They were relaxing in a patch of shade, escaping the relentless heat of the summer sun. 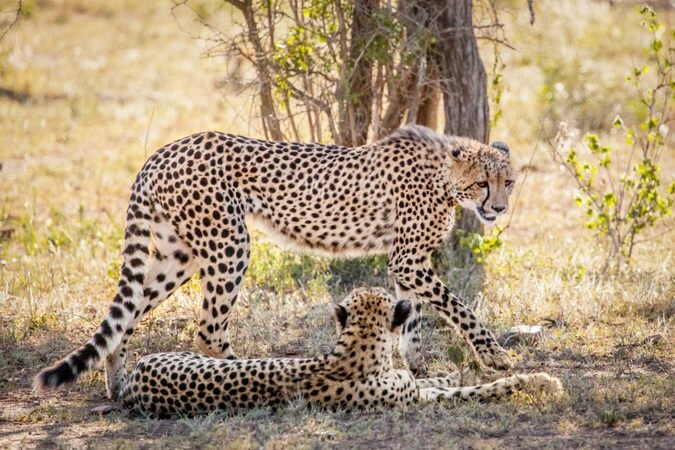 Before long, however, something caught their collected attention and the cheetahs began to move off in a very determined manner. It was a herd of impala, not far off. Starting up the engine of the game vehicle, we began to follow the cheetahs as they stalked the herd and spread out through the bushes, positioning themselves for the attack. Unfortunately, one of the sub-adults got over excited and pounced too soon, causing the impalas to dart off in a cloud of dust. While their first attempt was unsuccessful, this did not deter the three hungry cats. We spent the next three hours watching these cheetahs, making sure to keep a respectful distance at all times. They would walk a bit, rest a bit, and repeat. Always staying upwind of the impala and keeping a watchful eye out for any opportunities. Their patience was incredible, and definitely paid off. As the light began to drop, the cheetahs started to gain on the herd, inching closer and closer, still completely unnoticed by the impala. Then finally, they made their move and the action was over almost as soon as it started. 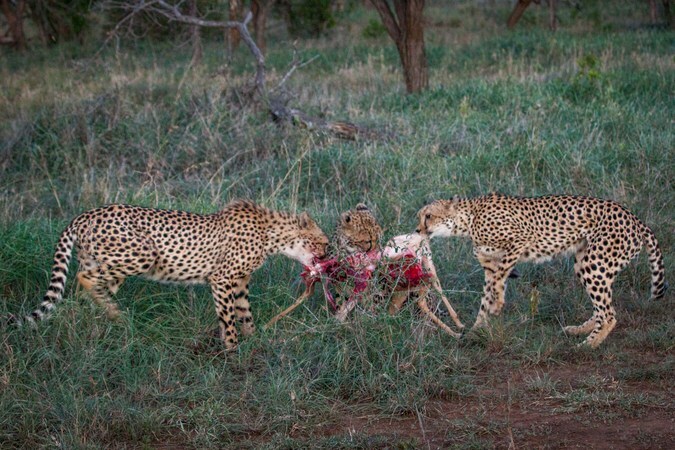 In a blur of activity, the cheetahs had managed to take down a baby impala and wasted no time in tucking straight into it. While it was a little gruesome to witness the demise of such a cute little creature, it was also a privilege to be a brief bystander to the circle of life in action. 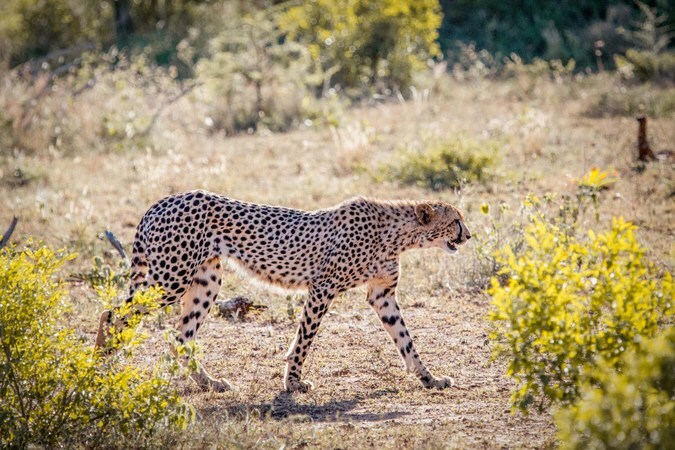 Just to see cheetahs in the wild is a huge treat, as they are listed as ‘vulnerable‘ in the IUCN Red List of Threatened Species due to loss of habitat, reduced prey and harassment from larger predators. Rhino River Lodge is a Big 5 safari lodge in KwaZulu-Natal, South Africa. 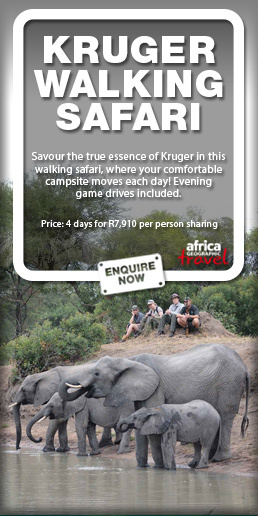 It is situated along the shore of the Msunduze River in the southern section of the Manyoni Private Game Reserve. 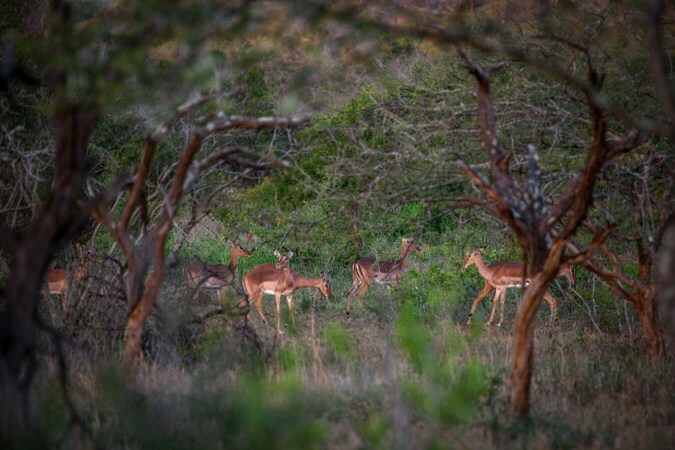 This 23,000 hectare private game reserve is located in the very heart of Zululand – just 30kms north of Hluhluwe Game Reserve. It’s in an area renowned for its African wildlife and rich cultural heritage. The private game lodge offers you an intimate and comfortable safari experience, with excellent game viewing and luxury accommodation.